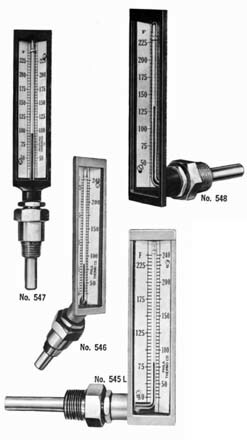 5½" Scale Submarine Thermometers - Philadelphia Instruments and Controls, Inc. - Specializes in the production of temperature related products. Bronze Case Submarine thermometers. These small size instruments are used extensively on board ship, for diesel and turbine engines, compressors, oil lines, etc. Brass, Steel, Monel and Stainless steel sockets available. ½" - ¾" or combination ¾" and ½" N.P.T. Sockets are made to Navy specs. Same accurate thermometer as above except separable socket is secured on to stem of thermometer by a set screw. Lens front red reading mercury tube. Offered in straight and back angle pattern only. 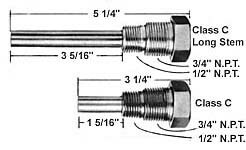 Ranges -40° F to 110° F, 30° F to 240° F. Brass or steel separable sockets either ½" or ¾" N.P.T. Extension neck sockets also available. Modern mercury barometers have an enclosed reservoir for the mercury with only a tiny hole to let in the outside air. 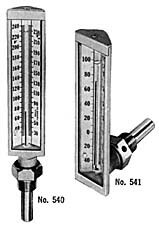 Usually a scale on the barometer tube allows the mercury column to be measured directly. Since the level of mercury at the bottom rises or falls as mercury flows out of or into the tube, some allowance must be made for the change in this level. In the Fortin barometer, the reservoir can be raised or lowered by an adjusting screw. This allows the surface of the mercury to be put at the zero mark on the scale for easier reading. In the Kew, or marine, barometer, the reservoir cannot be moved, but the scale is graduated to allow for mercury-level changes. Any liquid could be used in a barometer. However, because all other liquids are lighter than mercury, they would require much longer columns. Water, for example, would need a column more than 30 feet (9 meters) tall. The column needed for mercury is about three feet (one meter) high.